Third time's the charm - under clear skies, I got to set up my telescope and show the Moon to attendees of the Astronomy Night event at my wife's school... finally! As always, looking through my telescope was a first-time for several viewers, and I got the customary "Oh WOW!" from several people! Saturn, Jupiter and the star Antares are in the south-southeastern predawn sky all week. Saturn and Jupiter in the south-southeastern predawn sky Mar. 19, 2019. Credit: Stellarium / Bob Trembley. The image below is the same patch of sky above seen in infrared light - the disk and bulge of the Milky Way can clearly be seen! The south-southeastern predawn sky Mar. 19, 2019 seen in IR - data from 2MASS satellite. Credit: Stellarium / Bob Trembley. The waxing gibbous Moon can be seen setting in the western predawn sky on Mar. 19th. The full and waning gibbous Moon set a bit later each morning. The waxing gibbous Moon setting in the western predawn sky Mar. 19, 2019. Credit: Stellarium / Bob Trembley. The Moon will appear near the star Spica in the southwestern predawn sky on Mar. 22nd. The waning gibbous Moon near the star Spica in the southwestern predawn sky Mar. 22, 2019. Credit: Stellarium / Bob Trembley. The Moon joins Jupiter and Saturn in the south-southeastern predawn sky Mar. 25th. The Moon, Saturn and Jupiter in the south-southeastern predawn sky Mar. 25, 2019. Credit: Stellarium / Bob Trembley. Mars near the Pleiades in the western sky after dark on Mar. 25, 2019. Credit: Stellarium / Bob Trembley. On February 28, 2006, NASA and the European Space Agency released a very detailed image (below) of the Pinwheel Galaxy, which was the largest and most detailed image of a galaxy by Hubble Space Telescope at the time. 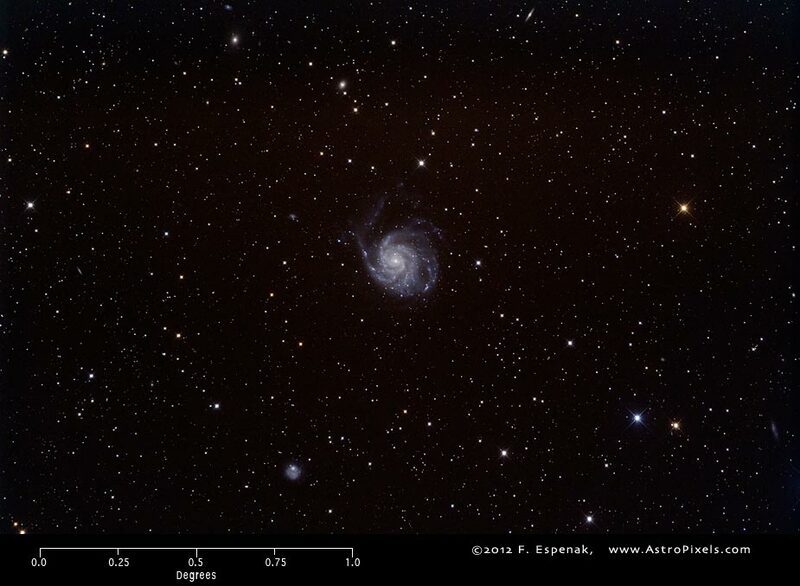 The image was composed of 51 individual exposures, plus some extra ground-based photos. This new Hubble image reveals the gigantic Pinwheel galaxy, one of the best known examples of "grand design spirals", and its supergiant star-forming regions in unprecedented detail. The image is the largest and most detailed photo of a spiral galaxy ever taken with Hubble. The Moon is a waxing gibbous, visible to the southeast in early evening, and up for most of the night.. The full Moon occurs on Mar. 20th, rising at sunset, high in the sky around midnight, and visible all night. After the 20th, the Moon will be a waning gibbous, rising after sunset, high in the sky after midnight, and visible to the southwest after sunrise. The Moon from Mar 19-25, 2019. Visualizations by Ernie Wright / NASA's Scientific Visualization Studio. We have a spot! SpaceWeather.com notes that sunspot AR2735 is a remnant member of old Solar Cycle 24. Sunspot AR2735 on Mar. 19, 2019. Image courtesy of NASA/SDO and the AIA, EVE, and HMI science teams. 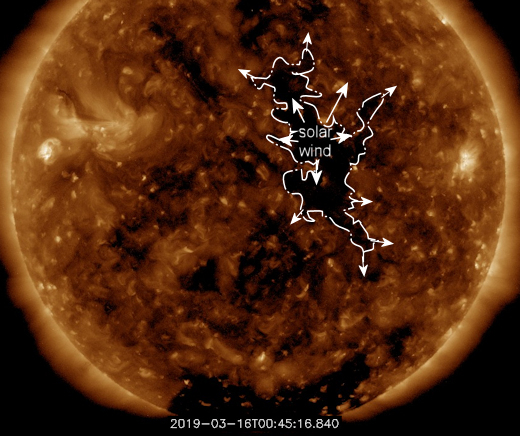 Both northern and southern coronal holes remain open; a small hole appears at the equator - if the hole does not close, it will rotate out of view in a couple days. SpaceWeather.com says: "Geomagnetic unrest is possible on March 20th when a stream of solar wind hits Earth's magnetic field. The gaseous material is flowing from a minor hole in the sun's atmosphere. Arctic sky watchers should be alert for auroras mixed with full moonlight." Several small but very nice loop prominences on the Sun's limb for the past couple days; sunspot AR2735 is the bright orange region just above the equator. The solar wind speed is 365.5 km/sec (↑), with a density of 10.3 protons/cm3 (↑). On Mar. 18, 2019, the NASA All Sky Fireball Network reported 5 fireballs. #Fireball caught over Elmira Corning Regional Airport, NY last night. Position of the planets in the Innersolar system, Mar. 19, 2019. Credit: NASA Eyes on the Solar System / Bob Trembley. Position of the planets in the middle solar system, Mar. 19, 2019. Credit: NASA Eyes on the Solar System / Bob Trembley. Position of the planets in the outer solar system, Mar. 19, 2019, highlighting Dwarf Planet Pluto. Credit: NASA Eyes on the Solar System / Bob Trembley. The Pluto system, Mar. 19, 2019, highlighting Dwarf Planet Pluto. Note the difference in the plane of Pluto’s moons compared to the plane of the ecliptic. Credit: NASA Eyes on the Solar System / Bob Trembley. NASA - The Lunar Gateway: We're Going Back to the Moon! 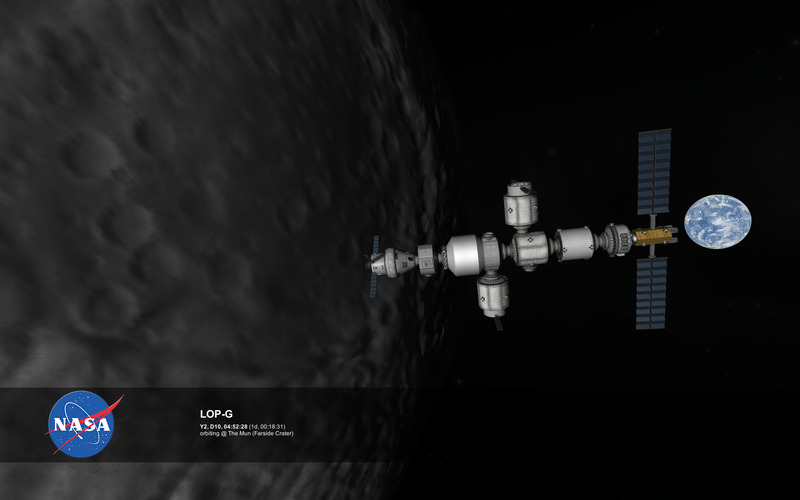 Replica of the Lunar Orbital Platform Gateway in Kerbal Space Program. Credit: RundownPear. Mars InSight - Minitremors detected on Mars! Above an ocean exoplanet, with a Moon and Nebula. Credit: Space Engine / Bob Trembley. Space Engine: a free 3D Universe Simulator for the PC. Just watched NASA’s #Moon2Mars Update. Excited that America and Americans seem to be more interested in space and space exploration than they’ve been in a long time.